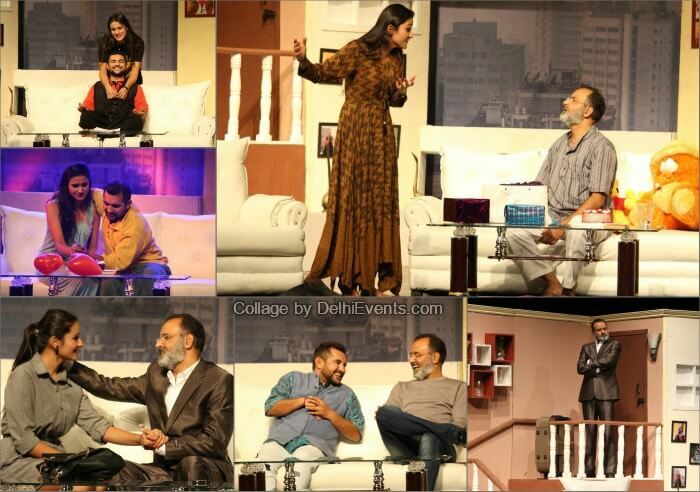 Event Description : THEATRE "Dad's Girlfriend" Hindi Comedy Play. Synopsis of the play : Mr. Vaidya a famous author, speaker and professor has had a very successful career but in the process he could never give time to his family, his wife and a daughter, Diya. Diya is now married to Kanav, a theatre artist against the wish of Vaidya. Now, Vaidya has come to stay with Diya for few days and starts discovering his relationship of a father and daughter for the first time. At the same time his tiff and friction with the funny Kanav continues. Things take a strange rather funny turn when Avni, an old student and fan of Vaidya shows up in the same city and now starts visiting Vaidya quite often. Diya, who is otherwise very kind and generous start having a feeling of insecurity with Avni as she is taking away her share of time and attention from her father. This gives rise to various funny confrontations and situations and Kanav plays the pacifier in all situations. In the end Vaidya finds himself standing at a crossroad where he has to choose between the two. What will be his decision? Come and discover in this funny tale of lost and found relationships in Atul Satya Koushik’ next biggie, Dad’s girlfriend. Atul Satya Koushik is an alumnus of Sri Ram College of Commerce (SRCC, Delhi) and is a qualified Chartered Accountant. He also holds a degree in Law. - All of 31, he has already written 12 full length theatre plays and produced and directed 15 theatre productions with over 250 shows in different parts of India. He is often credited for pioneering modern commercial theatre in Delhi, running many ticketed shows to full houses on the trot and roping in celebrities in his theatre productions. His trademark productions include "Chakravyuh", "Draupadi", "Kahani Teri Meri", "Saudagar" (Merchant of Venice), "Wo Lahore", "Couple Trouble" etc. After a successful launch of our new play, we are proud to announce that it's happening again! Film and Theatre Society : We are Delhi’s renowned theatre group which has created its niche throughout India and is slated to perform overseas very soon. After the nationwide success of his plays "Chakravyuh" featuring Nitish Bharadwaj, "Raavan ki Ramayan" featuring Puneet Issar and "Draupadi" featuring Rakesh Bedi and Himani Shivpuri, writer-director Atul Satya Koushik is ready to present something which is totally different from his forte "Dad's Girlfriend" -an urban family entertainer in hinglish.